Twin Plays "House & Garden"
From Sir Alan Ayckbourn, author of "Absurd Person Singular," comes a pair of interlocking comedies that take place simultaneously, with one cast performing both shows in two different theaters at the same time -- all taking place at Trinity Repertory Theatre in Providence. Directed by resident company member Brian McEleney, "House & Garden" opens on May 16 and will run through June 30 in both the Chace and Dowling Theaters. A masterfully constructed duo of plays, "House & Garden" are like two opposite sides of a theatrical puzzle -- the picture gets clearer, funnier and more profound when you return to see the second side of the story. Set in the same time span over the course of one day, the plays show two different sides of the comings and goings of planning an annual neighborhood garden party. Each play is set in a different locale. "House" -- as the name suggests -- keeps its characters firmly ensconced in the living room of homeowners Teddy and Trish. Teddy has had an affair with the neighbor's wife and now his marriage is in dire jeopardy. The fact that his neighbor’s son, Jake, is in love with his daughter makes things even more complicated. Meanwhile, in "Garden," the household help are busily preparing for the upcoming garden party. Add to the mix a dash of very influential guests, a vivacious French film star, and pretty much the entire neighborhood and you soon have a comical combination of wacky characters, gin-soaked truths and topsy-turvy storytelling. While the actors race from "House" (in the upstairs theater) to "Garden" (back downstairs in the first floor theater), the lucky audience stays put, seeing each production one at a time, in either order. The production features an ensemble of Trinity Rep favorites, including resident company members Angela Brazil, Janice Duclos, Phyllis Kay, Barbara Meek, Anne Scurria, Fred Sullivan, Jr., Stephen Thorne and Joe Wilson, Jr. Guest artists include Mary C. Davis and Barry M. Press and Brown/Trinity MFA students Catherine Dupont, Steven Jaehnert, Ted Moller and Bridget Saracino. The seven member children's cast features: Swansea resident Lauren Durkin; Warwick resident Kate Fitzgerald; Cranston resident Bedros Kevorkian; Providence residents Margo Herreid, Elliot Peters and Phineas Peters; and Pawtucket resident Taliq Tillman. Alan Ayckbourn is one of England’s most successful living playwrights. He has written and produced 72 full-length plays in Scarborough and London and was the artistic director of Scarborough’s Stephen Joseph Theatre from 1972 – 2009, where all but four of his plays have received their first performance. His major successes include "Absurd Person Singular" (1975), "The Norman Conquests" trilogy (1973), "Bedroom Farce" (1975), "Woman in Mind" (1985), "House & Garden" (1999) and "Private Fears in Public Places" (2004). His plays have won numerous awards, including seven London Evening Standard Awards. Ten of his plays have been staged on Broadway, attracting two Tony nominations, and one Tony Award. 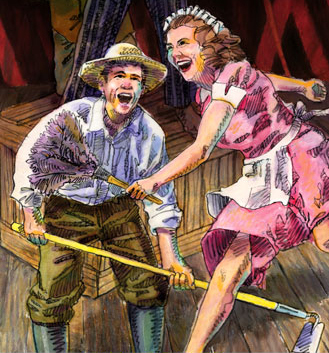 Talkbacks will be held after every performance of "House & Garden." Audience members are invited to share their response to the play’s production and themes for approximately twenty minutes. Each talkback will conclude with a short walk retracing the actor's trek from one set to the other during performances.